Embd is situated 16 km. south of Visp. 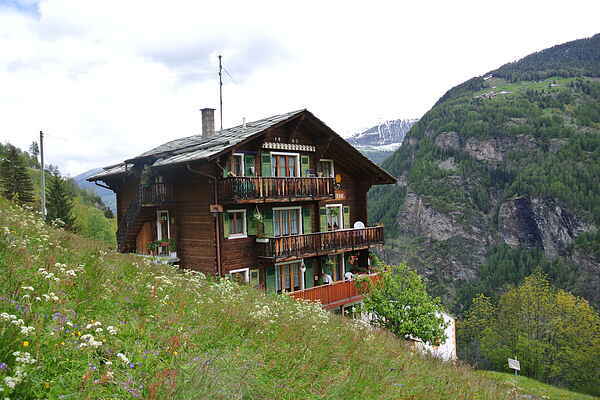 It is a small mountain village at a height of 1300 m. From Embd you can easily reach both the Mattertal and the Saastal. Therefore we certainly recommend a visit to Saas Fee and Zermatt. Furthermore you can make lots of walking tours in the immediate surroundings. House Bergtreue is situated in a quiet hamlet of Embd, next to a chapel. The spacious accommodation (110 m) is on the 1st floor and has its own entrance. It has a rustic and well kept interior. The balcony (with garden furniture) is blessed with a beautiful view of the surrounding mountains. The female owner loves to grow flowers so you will be able to enjoy lots of pretty flowers in the garden and on the balcony.